This is a sponsored post written by me on behalf of Johnsonville. All opinions are 100% mine. I am totally guilty of taking the short cut on breakfast. My poor boys either get oatmeal, cereal or boxed pancakes. But today was different when I reached in the fridge to grab some almond milk for cereal I glanced down at the Johnsonville Sausage and got inspired. I recently shared with you about the Johnsonville Fire House Challenge, where Atlanta fireman competed for the title of best chili or stew recipe and ever since I have looked for inspiration to come up with my own one pan recipe to share with you all. Luckily, I had all the ingredients I need to make what my husband called “One of the best omelettes I’ve (he’s) ever had” score! Pictured above are the basic ingredients for the Andouille Sausage and Kale Omelette. Johnsonville Andouille Sausage, kale, cheddar cheese, Rotel tomatoes, salt , pepper and eggs. Not pictured is the olive oil spray I used on my nonstick pan. If you have never made an omelette before here is a tip. DO NOT add any liquid to your eggs, you want your eggs firm not runny. 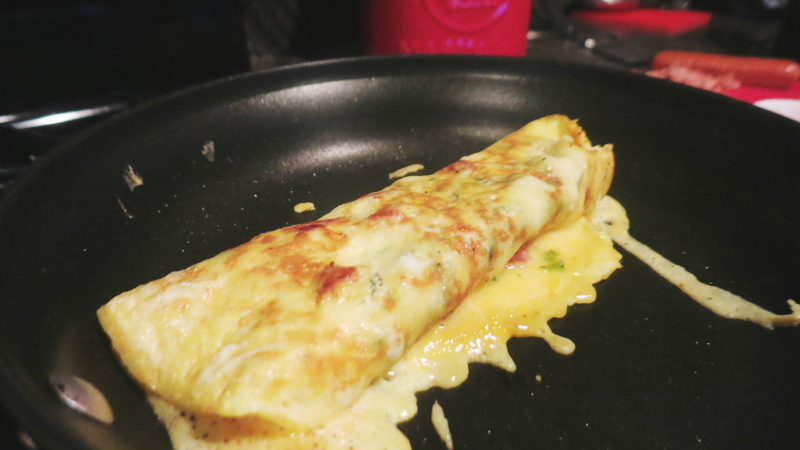 I fold my omelettes into thirds after it has cooked on medium high for approximately 3.5 minutes. That extra 30 seconds gives it that brown crust that I love without over cooking it. We had never had omelettes with kale or Rotel in it before I created this recipe, but for my family who has fallen in love with kale recently and has always loved or meals spicy this is a match made in heaven. Kale has so many health benefits I am happy to incorporate it into as many meals as possible. Check out all of Kales benefits here. If the dance moves, hearty mouthfuls and finger licking doesn’t convince you to try it I don’t know what will. Thanks to our friends at Johnsonville for inspiring a delicious meal and for supporting our community helpers! Chop Sausage and finely cut kale. Scramble eggs add salt and pepper. Heat pan on medium high. Spray pan with olive oil spray. Layer in eggs, kale, sausage , rotel and than cheddar cheese. Cook for 3.5 minutes. Fold into thirds onto itself. Cut off heat and allow to rest for 30 seconds. YUM! That omelette looks amazing. Sausage and kale are a great combination, I’m sure it was delicious. Battery that omelette sounds absolutely delicious. I can’t wait to try it. oooh, I am a nut for breakfast sausage. And eggs. Someone make me this STAT! That sounds absolutely delicious. Andouille sausage is a special kind of amazing and kale is so good for you. I too love Andouille sausage! Oh yum! I could definitely go for some of these in the morning. I’m glad you included kale because I’m trying to add more into my diet. That omelette looks delicious! I typically do spinach in my eggs, but I wonder if I’d like kale instead. My kids make their own breakfasts each morning and they typically make eggs and toast but every once in a while, one of them gets creative and makes an omelette. I may have to encourage them to try kale and sausage in their omelette! Looking forward to the time when my kiddies can prepare a few meals! I like delicious, easy to make quick breakfasts. Every ingredient sounds tasty (even the kale) and your presentation makes it look tasty, too. It’s a creative omelette that I’ll be trying soon. Let us know how you liked it. Omelette is one of m favorite breakfast, this one looks yummy and tasty. Now I have a new breakfast idea or brinner (breakfast for dinner). We get eggs from my parents chickens so this would be a great thing to add to our menu. Plus a bonus that it has a lot of protein. Mmm, I love a good omelette! 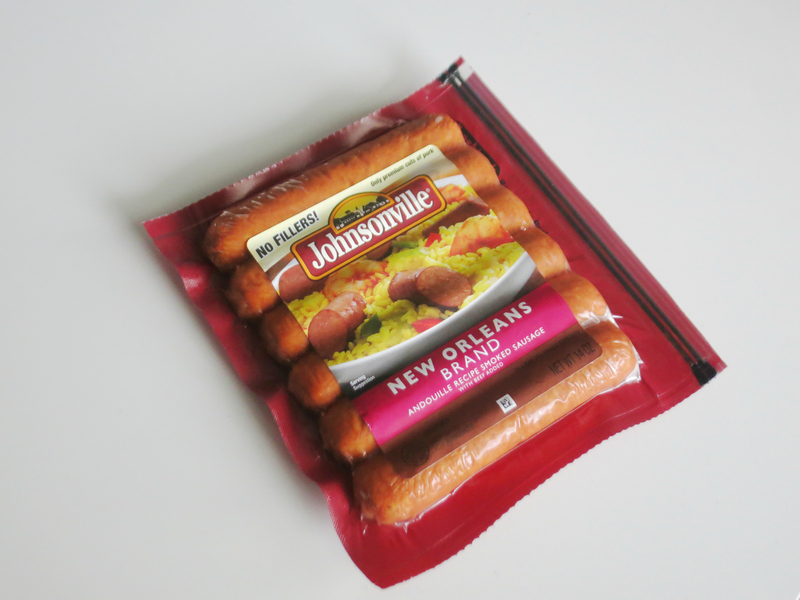 And who doesn’t love Johnsonville sausage? We always stock up while it is on sale. This omelette looks really delicious …. I will have to try to make it. 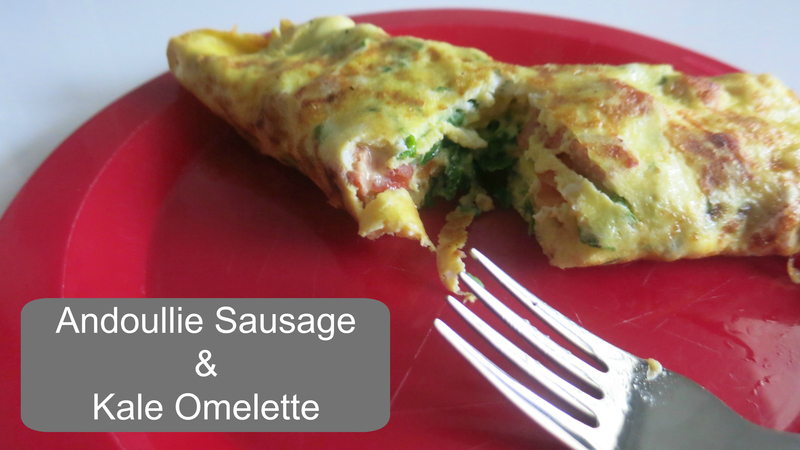 My middle loves omelettes, I bet I could sneak this in as a healthy treat options for him for breakfast! 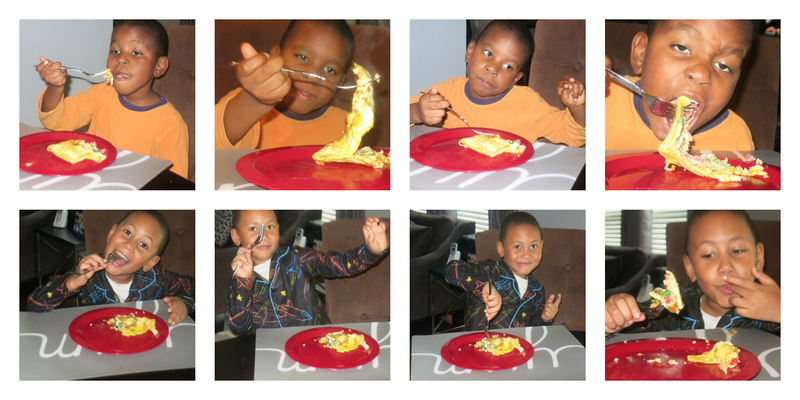 My little guy usually avoids green food like the plague, but he gobbled this omelette up no questions asked. 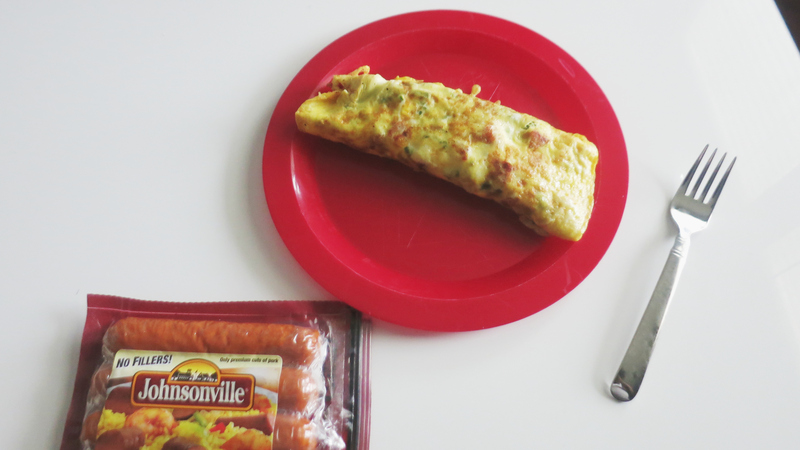 I love sausage and kale omelets. I hadn’t thought to use the andouille. i usually use like a polish or kielbasa. The andoiuille is probably delicious. If you like it with a little spice this is the recipe for you. This looks very tasty. I really like this product they have many great flavors. Thank you for sharing. I’m ready to go to bed ASAP so I can wake up and eat this. Oh my!!!!!! I love cooked Kale and I also love sausage, and egg, so you pretty much put all of my fav breakfast foods together. Let us know how you liked it! That looks delicious. This is my kind of omelette. Mmm. That looks so delicious. That would be a great weekend breakfast to enjoy with the kids. I go throught periods where I have egg aversions. Your omlete is making me want to try one. Oh wow that looks really yummy! I’m always looking for new breakfast recipes! Rachelle J recently posted…10 Plus Size Dresses That Are Perfect For The Holidays! My husband would love this omelette. I’ll have to try it! I love andouille sausage, but have never paired it with kale. This sounds delish! 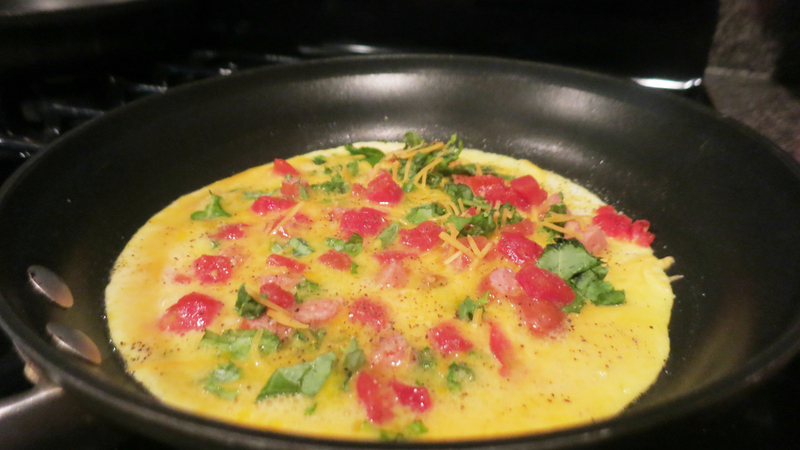 Wow…this omelette looks so delish, I am going to make them this weekend.